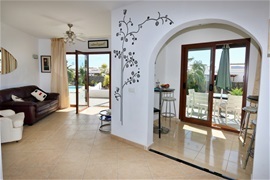 Villa Kate is a lovely 2 bedroom 2 bathroom villa, beautifully decorated with natural light filled rooms. The stunning outdoor space features gorgeous tropical surroundings. Soak up the sun in the private pool garden. An intimate haven for pure luxurious relaxation. 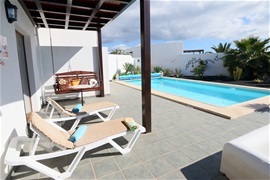 This fully equipped villa is not on a holiday complex (it is literally a 1 min walk from villa Jag and villa Montana) located in a very peaceful area. The south facing sun terrace is bathed in sunshine all day and is equipped with table and chairs for out door eating, swing,4 sun loungers with cushions, 8 x 4 pool with walk down steps, poolside shower, BBQ and seating for many.